Lesley Kelly, left, and Kim Keller launched Do More Ag at FarmTech in Edmonton this week. An important new initiative to get people in the agriculture community talking about mental health was launched this week. 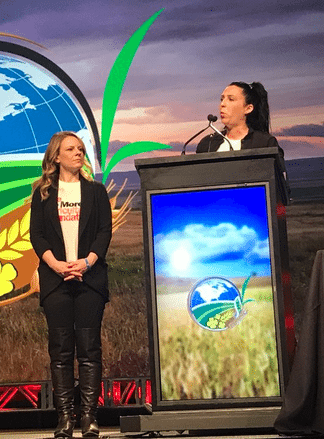 The Do More Agriculture Foundation — a not-for-profit whose mission is to create a culture in ag where all producers are encouraged/empowered/supported to take care of their mental wellbeing — officially launched at the FarmTech conference in Edmonton on Jan. 30. Do More Ag co-founder and farmer Kim Keller says this week’s launch is only the beginning of a conversation that will go on for years within the agriculture community. While she says things are improving with regard to breaking down the stigma associated with mental illness in agriculture, there’s a long way to go to help farmers get the help they need if struggling with mental health issues. “So much of a farmer or producer’s livelihood is out of their control. It’s market- or weather-based. At the same time, we have the culture in ag where we’re supposed to be tough and stoic and not talk about our feelings,” she says. At FarmTech, Keller and fellow Do More Ag co-founder, farmer Lesley Kelly, took part in a panel discussion moderated by Alberta Seed Guide publisher Shawn Brook about mental health in ag. Anyone wishing to help out in the effort to raise awareness of mental health in agriculture is encouraged to contact the Do More Agriculture Foundation through the contact form at domore.ag.